These TV Stands Reinforce Video Messagng With a Classic Poster! These TV Stands Sized for 42" Monitors Make Your Plasma Display Resonate With Every Viewer! 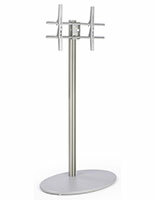 TVStandsOnly.com Stocks This Online! 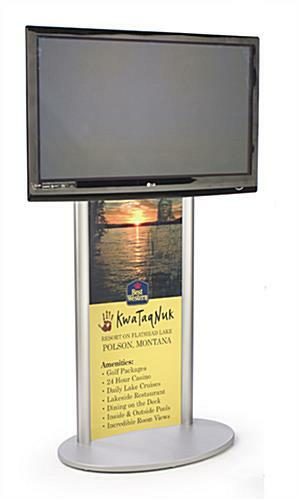 These TV stands, plasma mounts, and other flat panel holders are perfect for use in retail store, office, trade show, and conference spaces. 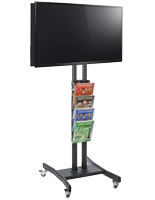 These TV stands can accommodate posters measuring 21-1/2" x 60". 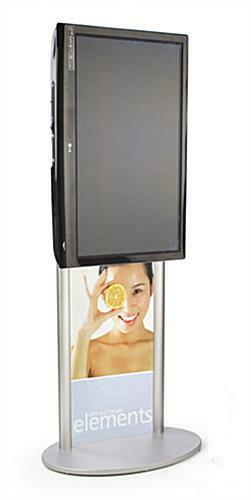 A non-glare lens shields your custom graphic and keeps it visible in any lighting. 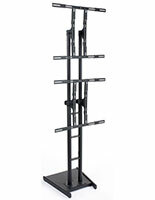 These TV stands have a VESA LG bracket that can attach to a 42" to 60" television monitor of up to 80 lbs. VESA brackets follow standard industry specifications, so they accommodate most television monitors. Our company includes the hardware required to mount your flat panel monitor, although some models may require special screws, obtainable at the local hardware store. 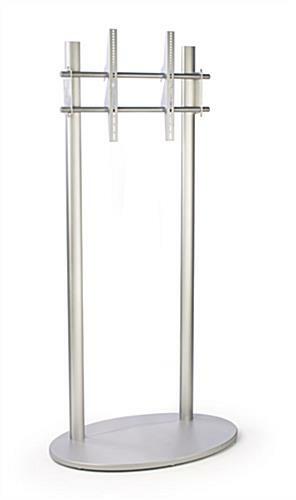 These TV stands sized for 42" monitors let you display your television horizontally or vertically. 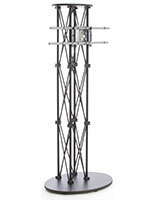 The bracket is also height-adjustable, so you can display your plasma monitor at the optimal viewing level. 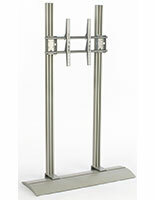 These plasma stands, TV stands ship to you unassembled, lowering shipping expenses. 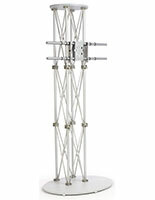 You can quickly and easily assemble the stand with basic tools. Fabricated in rugged aluminum and finished in satin silver, these TV stands are decor-neutral and withstand years of use. With (7) disc feet on the wide oval base, these flat screen holders, TV stands stay upright and stable in high-traffic settings. Showcase your Toshiba, Samsung, or other TV in style! Please Note: Graphic is not included with TV stands. When designing your images, keep in mind actual graphic size is 21-1/2"w x 60"h, where 1/2" on each side is covered. Your graphics should be printed on regular poster paper, to ensure that they fit securely within the grooves. This will not be a problem for any printing service facility.